Pete Berg heads west around the world! 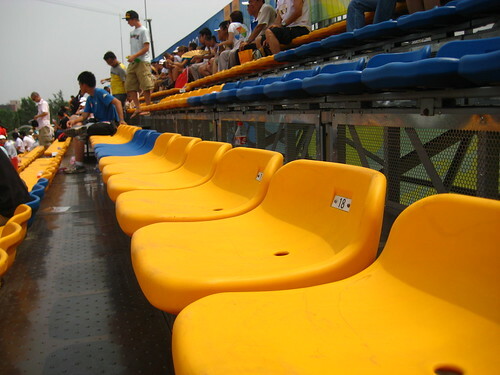 The number of empty seats is painful, especially when the demand is so strong. I purchased the BMX ticket from a scalper for 200 RMB — FIVE TIMES the 40 RMB ticket price — and many more people at my hotel were complaining that they couldn’t go to events because they didn’t have tickets. It’s really annoying for all of us in Beijing trying desperately to go to events, and on top of that, it makes the games a whole lot less exciting. Plus, the conspicuously vacant seats make the Olympics look a whole lot less exciting for people watching at home on TV. Second, Olympic sponsors were given huge numbers of tickets that they didn’t end up using either. The corporate sponsors gave the Olympic Committee millions of dollars so that they could have their name associated with the Games, and one of the parks was the IOC gave the companies tons of tickets to redistribute as they saw fit. Unfortunately, in many cases, the companies were too worried about their shlocky booths on the Olympic Green to actually send anyone to see the events. There were other reasons too. A lot of premium seats were reserved for press, athletes and Olympic officials, and the organizers were sure to save more than enough seats to go around…resulting in vacancies. But for the most part, there are empty seats because people simply aren’t using their tickets. It’s quite a drag. I just wish there were some kind of system so that, say, if thirty minutes into an event and the tickets still hadn’t been used, they’d let people in to fill them. Oh well. Pete, few days ago, I suddenly wanted to collect a whole set of Beijing Olympic Ticket Stub, I went to local website but all ticket information has been blocked, go to google get your blog, just wonder if you still keep the BMX ticket stub? I would like to buy one or two. email me yyang444@hotmail.com or above my company email, hope to hear from you. My name is Pete Berg, and I'm traveling around the world! This blog is about the things I see and do along the way. Feel free to leave comments, and stay updated by subscribing to the RSS feed.